8 pc. 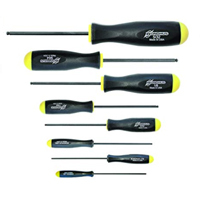 Set of Ball End Screwdrivers .050" - 5/32"
Ball End Tip Screwdriver 8 Piece Set with ProGuard Finish. Sizes: .050", 1/16", 5/64", 3/32", 7/64", 1/8", 9/64", & 5/32". Bondhus screwdriver tools are designed and manufactured to be strong and save time. Bondhus is the only hand tool manufacturer to design handle sizes proportional to the strength of the tool tip. This attention to detail reduces the possibility of applying too much torque to the tool tip, which could result in stripping or breaking of the tool tip or the screw head. All handles have cushioned surfaces to reduce fatigue during use and to improve grip, when hands are wet or oily. .050", 1/16", 5/64", 3/32", 7/64", 1/8", 9/64", 5/32"
8 Ball End Tip screwdrivers - sizes: .050", 1/16", 5/64", 3/32", 7/64", 1/8", 9/64", and 5/32"